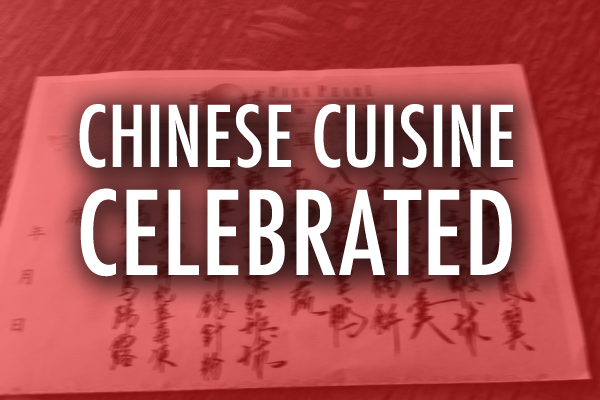 Vancouver is blessed by so many talented chefs. One who has been at it the longest and really has contributed immensely not only in Vancouver but across Canada and internationally is Bruno Marti. He was captain of the Western Canadian culinary team back in 1976, on the Canadian team winning gold at the 1984 Culinary Olympics in Frankfurt and manager of Team Canada in 1996 winning 3 more gold. 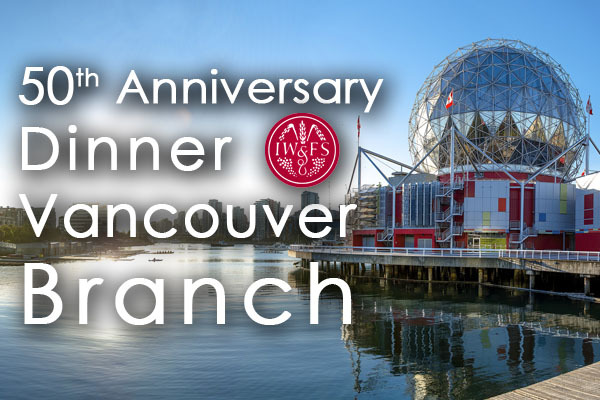 It was Bruno who your scribe arranged to coordinate all the chefs involved for the 50th anniversary IWFS Festival held in Vancouver in 1983 who made sure that no food item would be duplicated on any menu. 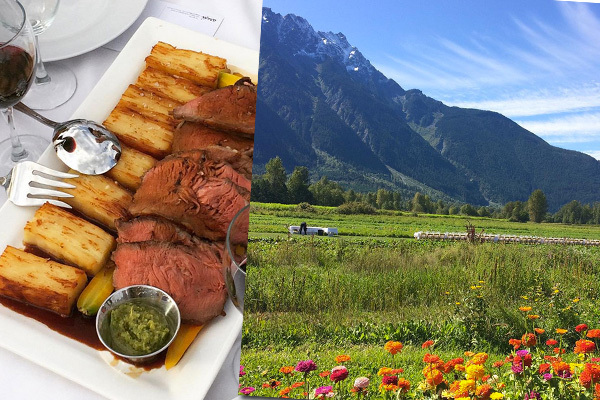 From his early days as catering manager of CP Air to operating his own esteemed restaurant La Belle Auberge in Ladner British Columbia, Bruno has seen and done it all as a chef. He has been actively involved in the judging process for the Bocuse d’Or for over 20 years and is even a member of the American Academy of Chefs Culinary Hall of Fame! One of his greatest contributions has been the conscientious mentoring of so many younger chefs. So what could be more appropriate then holding a recognition dinner honouring Bruno cooked for him and his admirers by some of those wonderful talents. 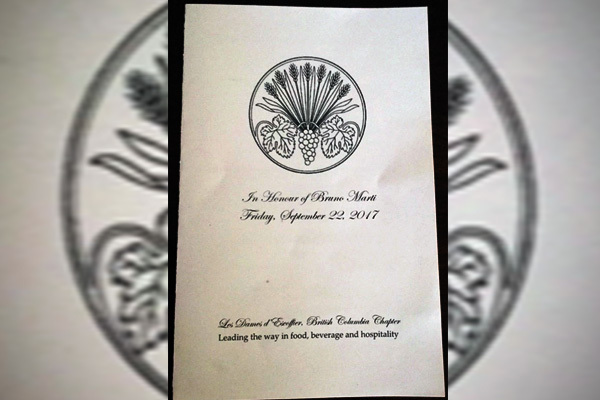 On Friday September 22, 2017 Les Dames d’Escoffier, BC Chapter did just that at the Four Seasons Hotel with nearly 130 people seated at one long table with a detailed history of his illustrious career at lesdames.ca. 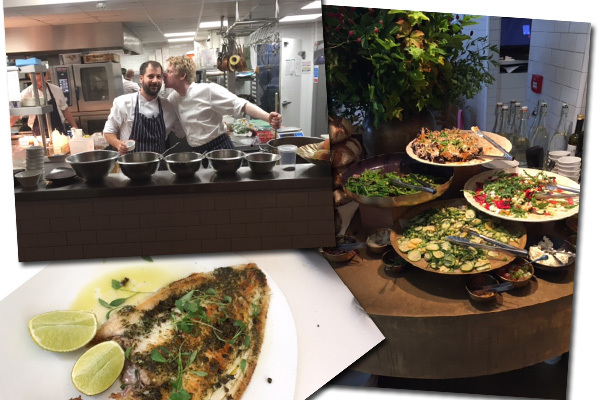 Some of the dishes even included spinach which may be Bruno’s favourite ingredient. Attached is the memorable menu. Congratulations and many thanks Bruno! 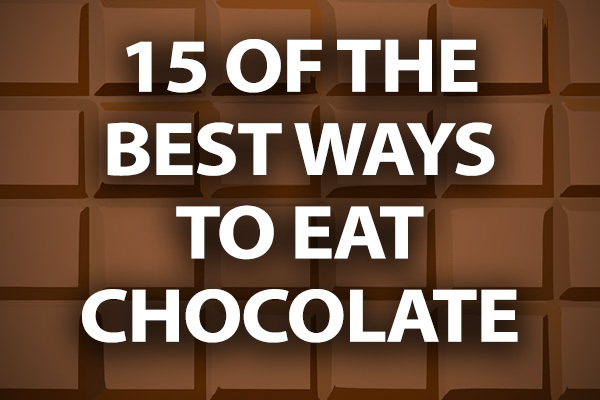 Hot or cold, crunchy or ooey gooey, chocolate is one of the most popular and comforting foods. 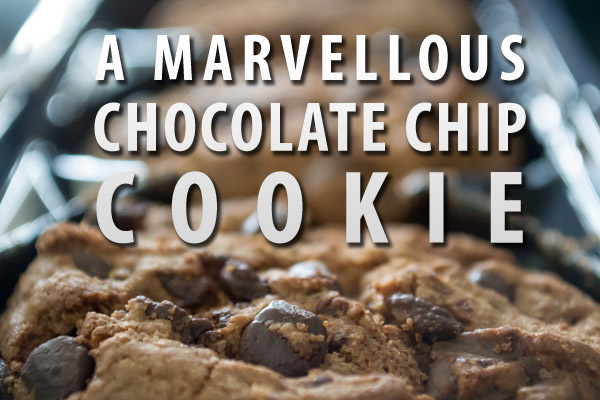 There are hundreds of ways to enjoy this delicious treat. Here are just a few of the very best. Ask Sid: Rubber Smell in Wines? Question: Recently tried a few wines that showed a rubber smell. What is that and how can you get rid of it? 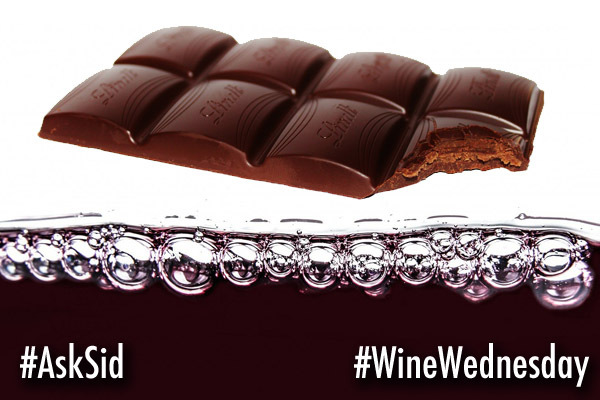 Answer: Probably a sulphur issue or mercaptans – giving off those rubbery strong onion & garlic aromas. 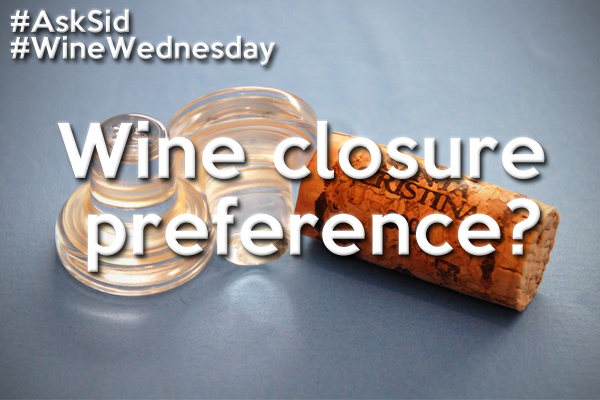 Also can be the result of a reductive style of winemaking or screwcap closure (resulting in an absence of oxygen) that may be improved by decanting the wine. Another thing to try is adding a penny (an old one made of real copper) into the decanter or your glass. Not always totally successful but usually helps. Just like trying that trick of plastic wrap for a corky TCA problem. Good luck. 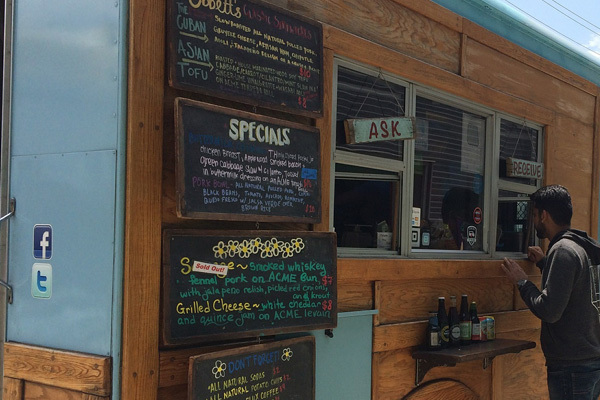 The food truck scene in Vancouver continues to thrive. 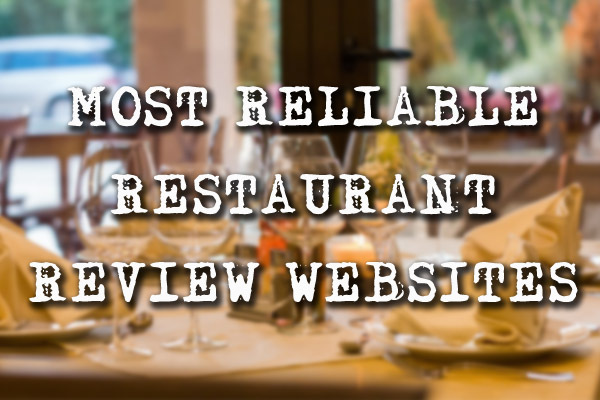 Both the casual innovative quality food served from them and the disincentive of high real estate prices to start up a restaurant has contributed to their success. 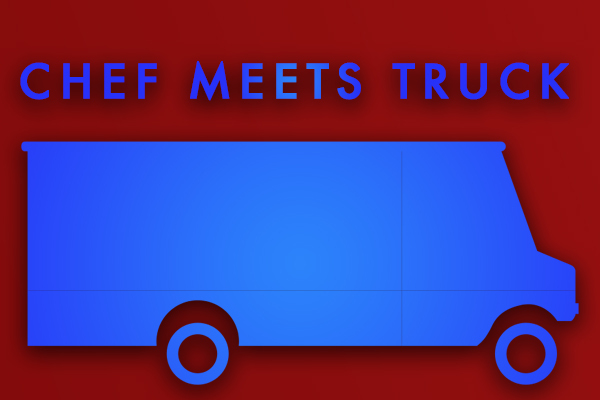 To show this phenomenon to advantage the chefstablesociety.com came up with the idea last year of having top restaurant chefs hop aboard local food trucks for an evening to jointly cook up some dishes. 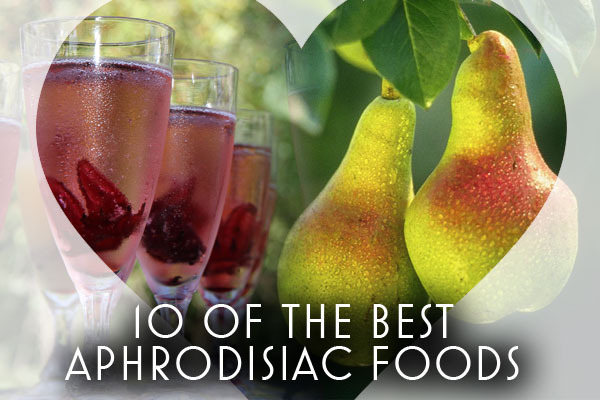 This was blogged on September 19, 2016 accessed here. 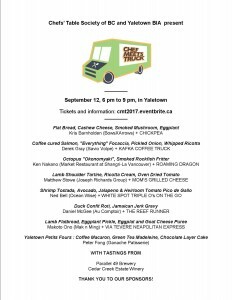 The second Chef Meets Truck in partnership with Yaletown BIA and supporting sponsors was held on September 12, 2017 on a clear sunny evening from 6-9 pm on a closed off area of 900 Hamilton Street at Nelson Street with 8 trucks plus 8 guest chefs. 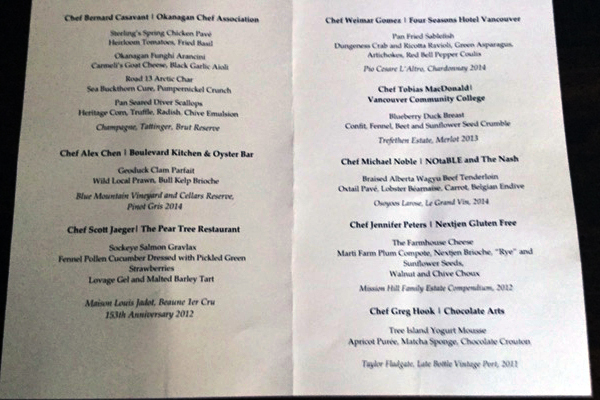 The Menu is attached showing these unique dishes they presented with excellent BC Okanagan wines from @CedarCreekWine & driven by thirst craft beer with character from @Parallel49Beer. 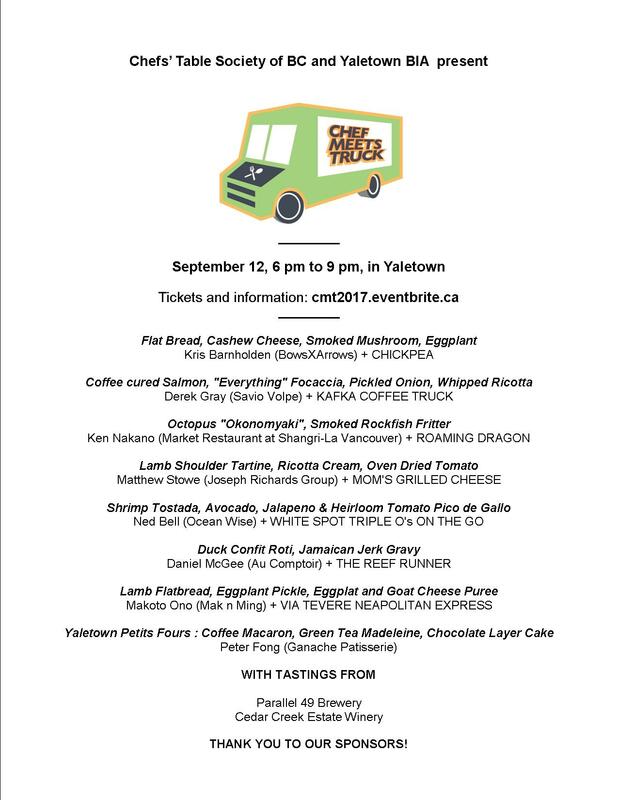 Part of the proceeds from the event is donated to the Greater Vancouver Food Bank. Which dish would you most liked to have tried? Which dish would you most liked to have tried?